Last summer we had the chance to spend about 24 hours in Memphis while we were on a road trip to Florida. 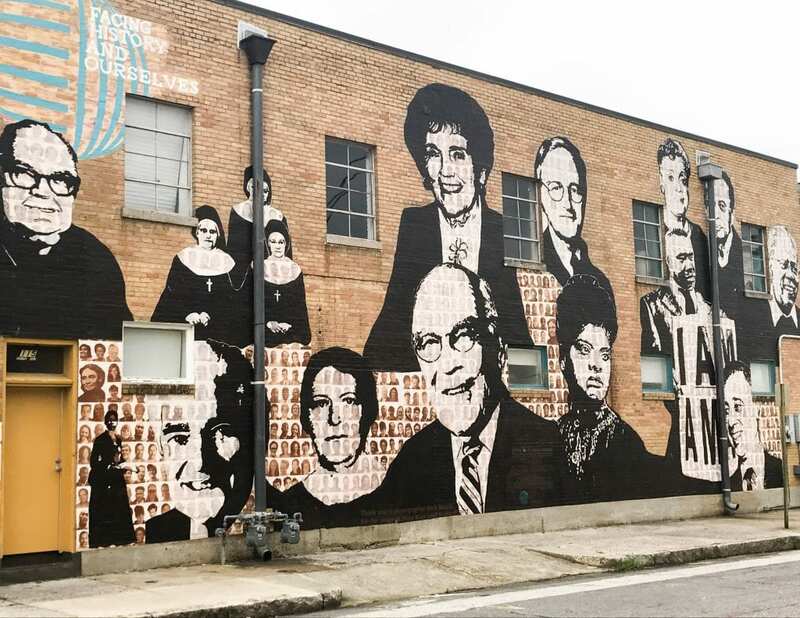 We’d stopped there once before to see Graceland and walk along Beale Street, but we hadn’t really had a chance to explore beyond that, so I was beyond excited. You may be thinking to yourself, “Twenty-four hours really isn’t very long.” Although that may be true, we have become masters at fitting many activities in short periods of time. Our thinking is: What if we never make it back? Will we have regrets? 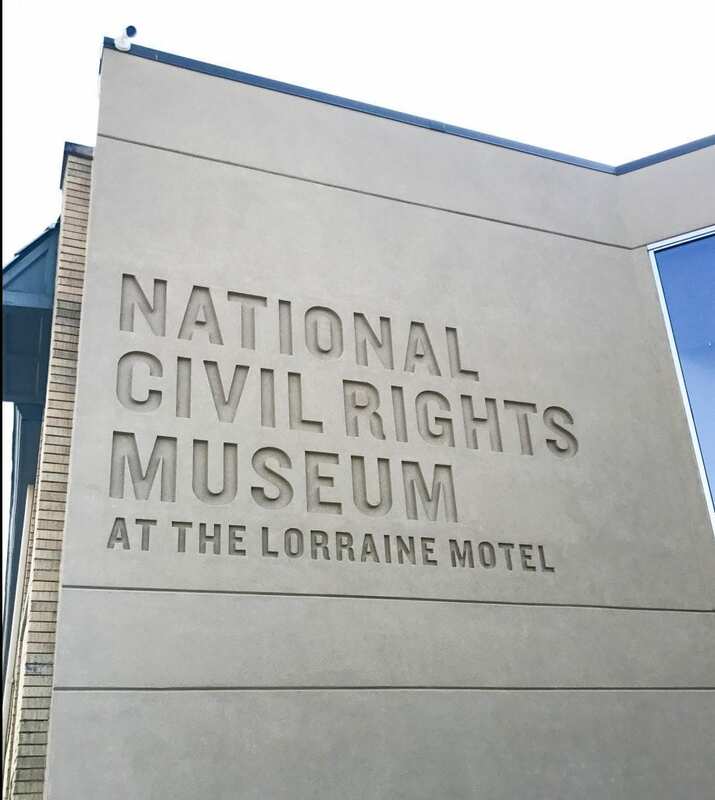 When I started looking into things to do, I knew immediately that I wanted to visit the National Civil Rights Museum at the Lorraine Motel. 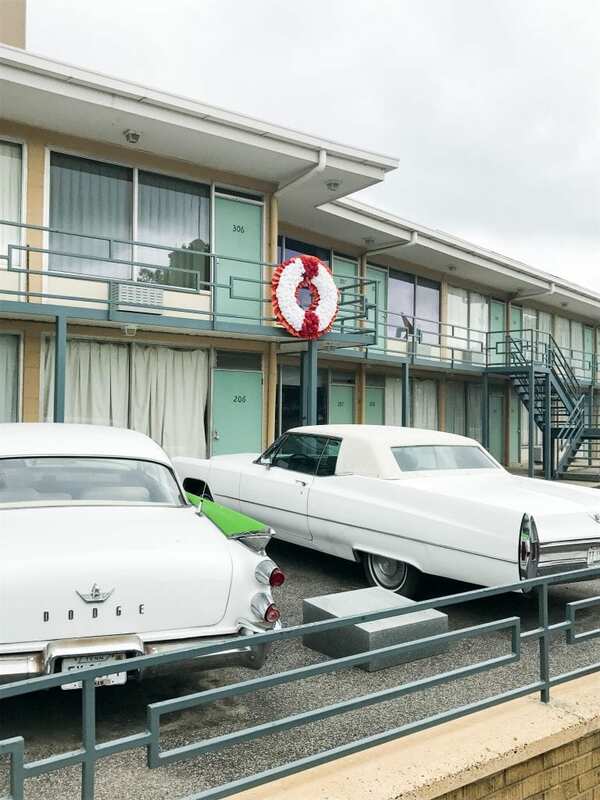 This is a museum built into the motel where Dr. Martin Luther King was assassinated in 1968. 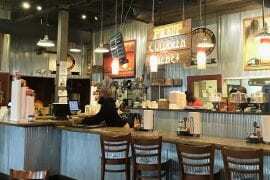 We reached Memphis just before 11:00 a.m., and our plan was to sample some Memphis BBQ and then explore the museum. Central BBQ is right across the street, and it is highly recommended. (It is also quite yummy!) We hit a slight snag in the plans, though. I’m usually on the ball with planning, but this time I overlooked the one day a week the museum closes–Tuesday. Of course, that was the day we arrived in Memphis. No big deal; we’d catch it the next morning. We arrived about 40 minutes before opening. I wanted to snap some pictures before we went in and avoid any crowds, if possible. I highly recommend this plan. A group of teenagers was preparing to tour the museum soon after we arrived but besides the group, there were only a few other smaller parties. When we left, it was much busier. Across the street from the museum is a tunnel that connects some other buildings that are part of the complex, but we did not tour this part of the museum. The gate is inspiring. The street art on this building is awesome, too. Soon it was time to go inside. The museum is beautiful. 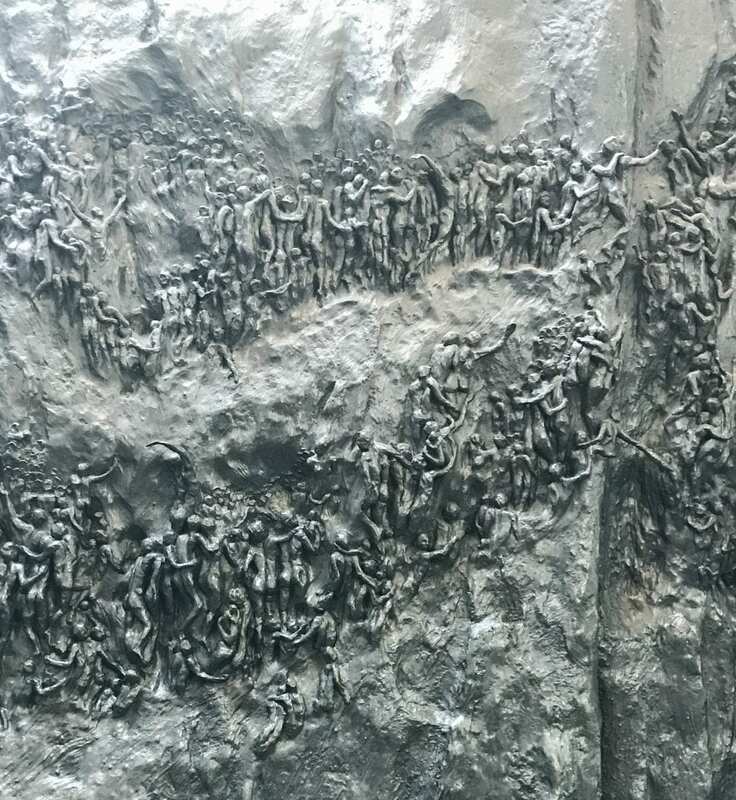 This sculpture welcomes visitors. 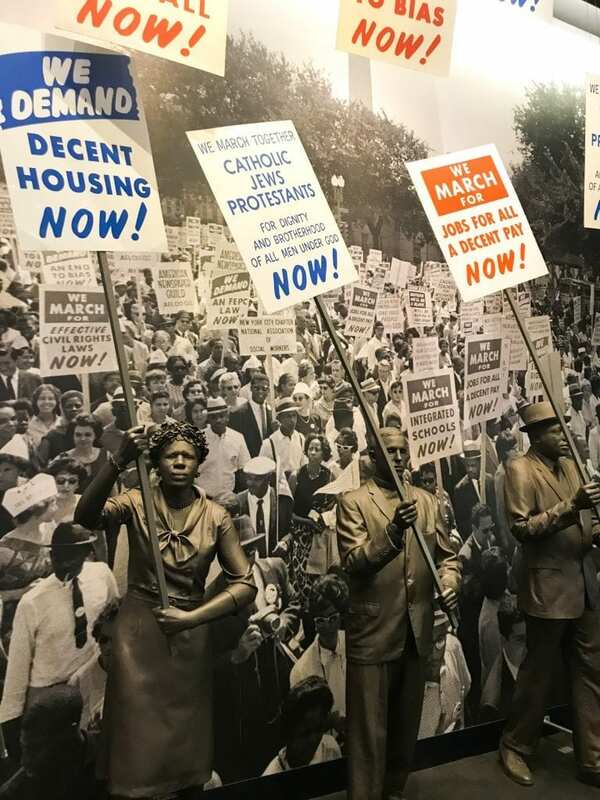 After you enter the lobby and purchase tickets, you embark on a journey that tells the story of African Americans in the United States and the Civil Rights Movement. Kristin really didn’t know a lot about the Civil Rights Movement. 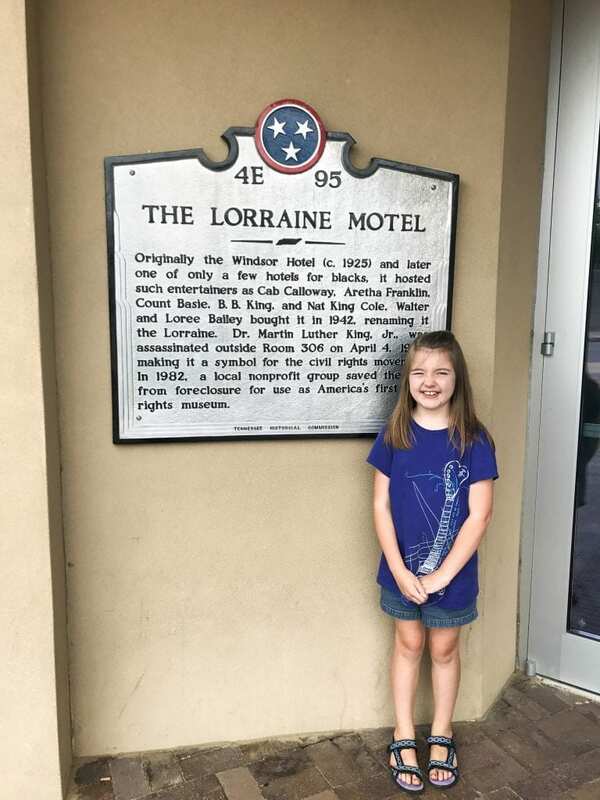 We’ve visited a few historical sites that have dealt with slavery, but she’d never seen anything about the Ku Klux Klan or Dr. Martin Luther King. When she saw some of the exhibits and photos, she had a lot of questions. Some of the exhibits are emotional, but I know that’s the intention. 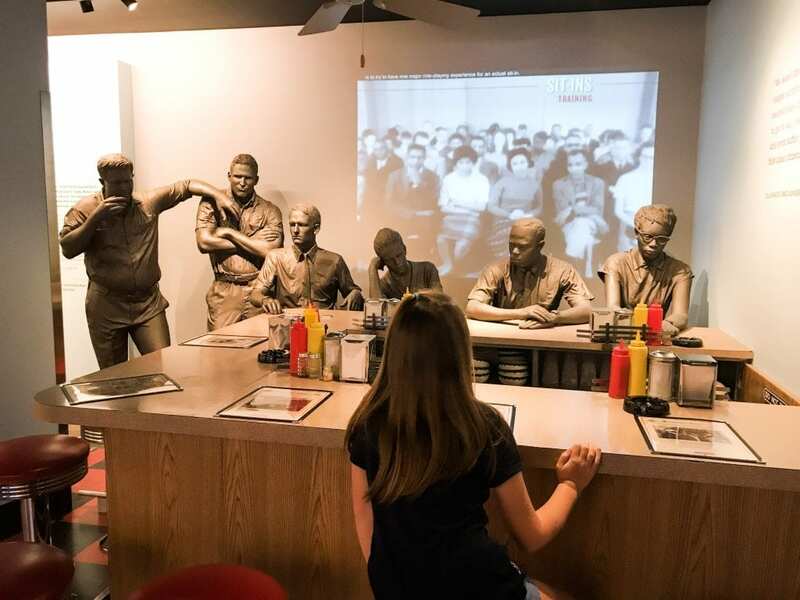 It’s important to me that Kristin learns about history and empathy, and museums like this help us to have a dialogue about things that have happened and how we can work towards making the world a better place. 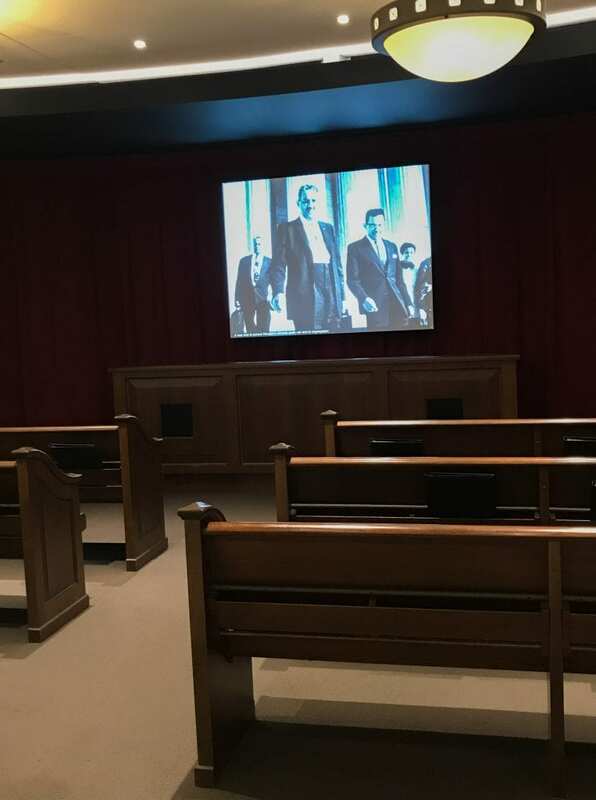 So many of the exhibits are interactive and allow you to walk a mile in someone else’s shoes, as Harper Lee might say. 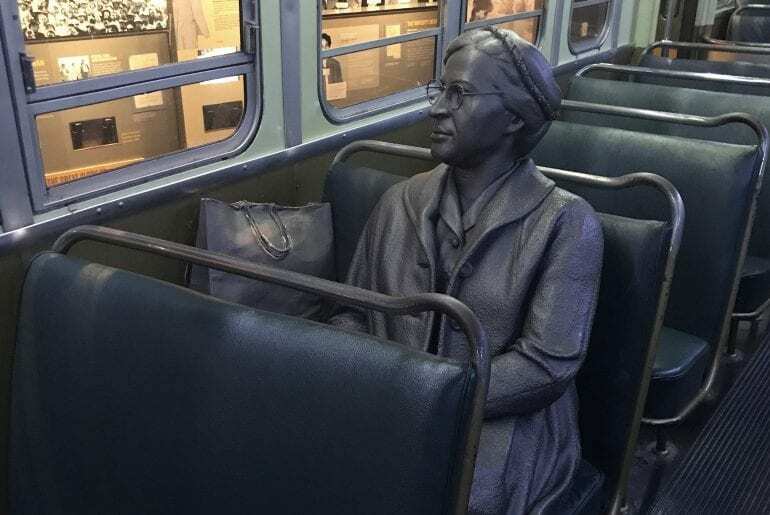 In this exhibit, you can actually board this bus and sit next to the statue of Rosa Parks who is seated inside. Some sound effects make this especially moving emotionally. So many displays are heartbreaking. I found myself asking myself “why” over and over. Why do people have to treat others so horribly? I also found myself asking the difficult questions. Would I have had the courage to stand up for myself or others? I think most of us would like to think so, and those that did stand up were so brave. I can only hope I can summon the courage to confront hate when I see it today. At the end of the tour of the museum, you do get to see inside the room King was staying in when he died. They’ve recreated the room with furnishings and details so that the room looks like it would have in 1968. It’s a place for quiet reflection. The above photo is the view of Room 306 from the outside. While it’s not easy to face some moments from our nation’s past, I know museums like this educate young and old. 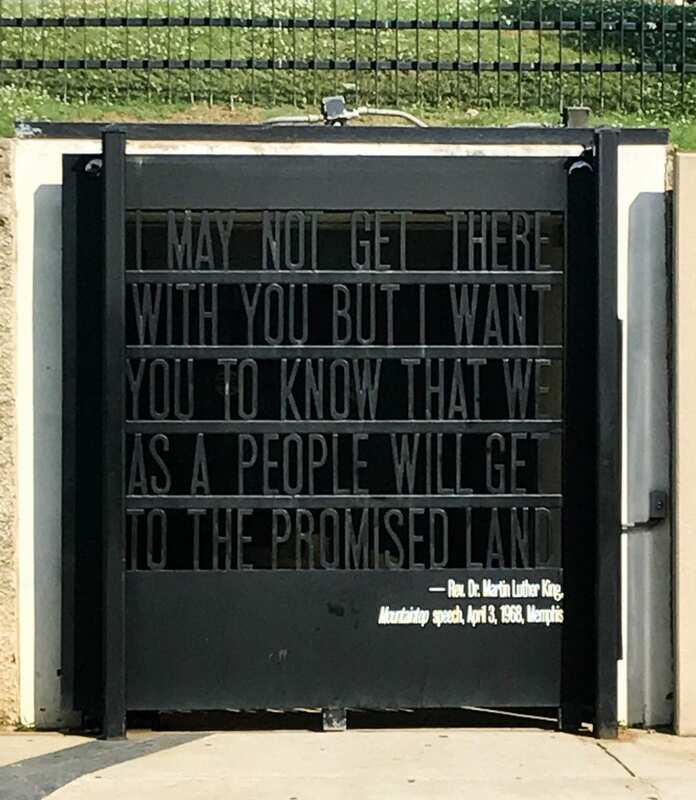 This museum is a wonderful way to honor Dr. Martin Luther King’s work and vision he had for America. While some exhibits caused a tightening in my chest, I left the museum feeling hopeful for our future. I know the road is still rocky and we have a long journey ahead, but I feel hopeful that future generations will learn from our mistakes and continue towards the dream of equality for all. 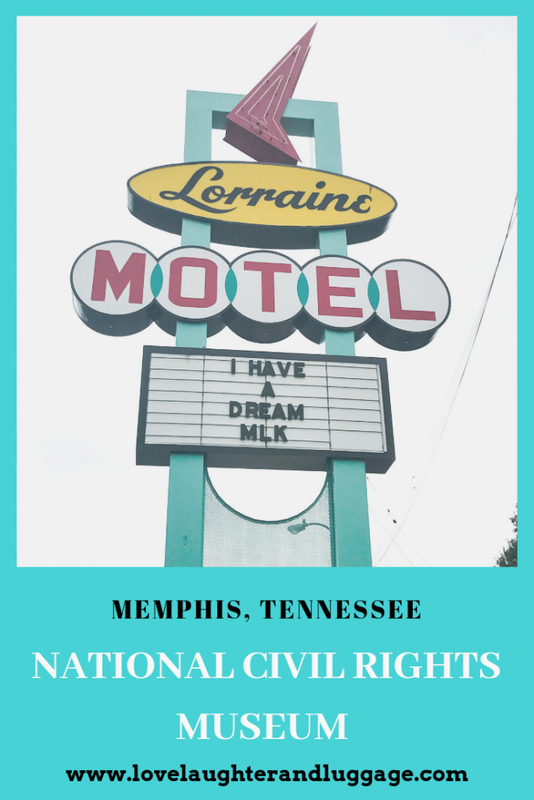 The National Civil Rights Museum is a must-do when visiting Memphis. 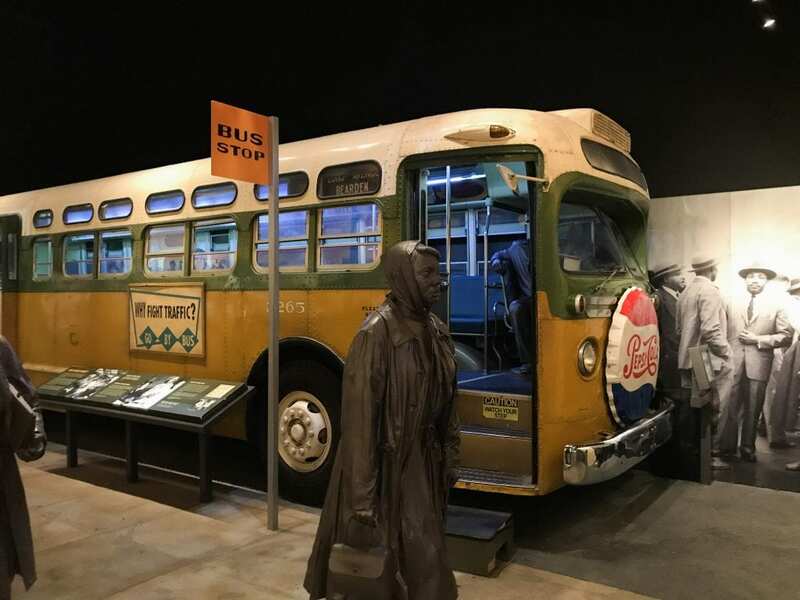 We’d love to visit this museum, because you are right… this is a great way to educate the youth. What a great trip! I’ve never been to Memphis or this museum. Makes me want to go! You should! We really like Memphis. Wow what an amazing and emotional place! I think it would be good for anyone to visit who needs to/wants to brush up on their history. I was just talking about this the other day! What a great use of space for a very important time in our history! THank you so much for sharing this! Wow, I had no idea that this even existed. What a great trip for the kids and a great reminder the adults. This is on my bucket list. My pastor mentioned his trip here on his last sermon. It was very moving. Love museums! Next time when visiting Memphis, will surely go there! Thank you for sharing the trip! I love this post! I’ve been wondering about this place for a while. This was an excellent ‘tour’ and makes me want to go even more now. I mean, I know I’ll cry a lot but SO important! Thank you!!! I’m emotional just looking at the pictures… This looks like an amazing place to visit. It’s so important to continue to teach our kids about the Civil Rights and show them that we’re not done. I love what you said about wondering if you would have the strength to stand up. I think of this too. Very cool post. What better way to teach your kids about history and the world around them. 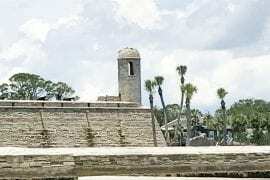 What an amazing place to visit with your children to teach them such an important lesson about our history! Great post! Makes me want to go to Memphis. I’ve been to Nashville, but never Memphis. 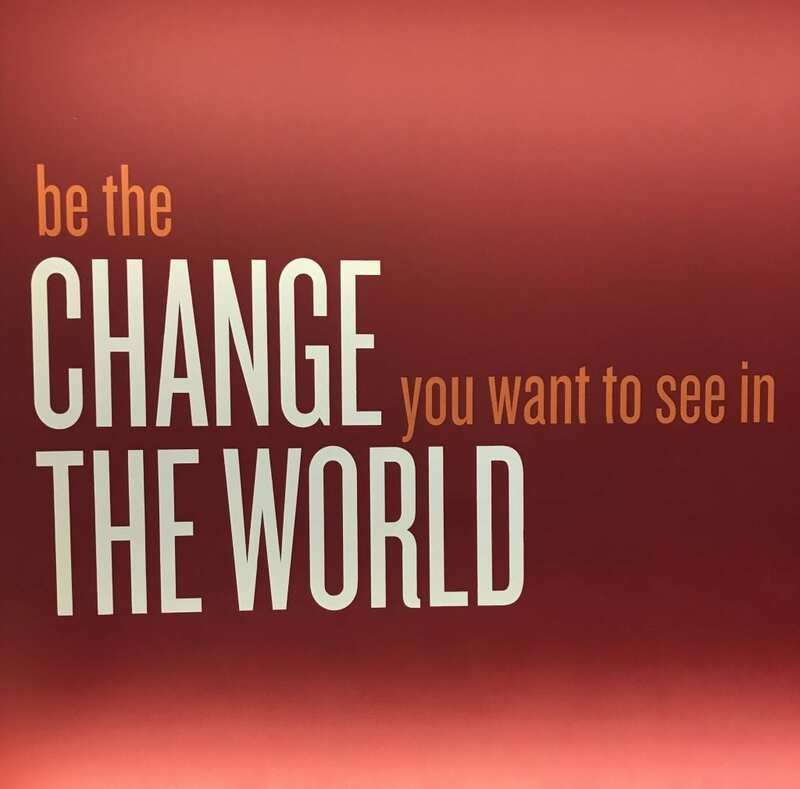 The quote, “Be the change …” is one of my all-time favorites and so very true. Thank you for this!!! I am totally into museums and exhibits that are real and engaging! This looks a truly moving experience! What a great place to visit! I would love to see this someday. I think it’s important to educate our children on some of the hardest times in history. My eight year old has been very curious this year and so we have discussed the Holocaust, the civil Rights movement and the suffragettes. Several of these topics came up while binge watching Dr. Quinn. I have heard about this museum and have wanted to go. This is one I would love to visit! Thanks for sharing the experience. I’d love to visit this museum. Thank you for a thoughtful piece about it. 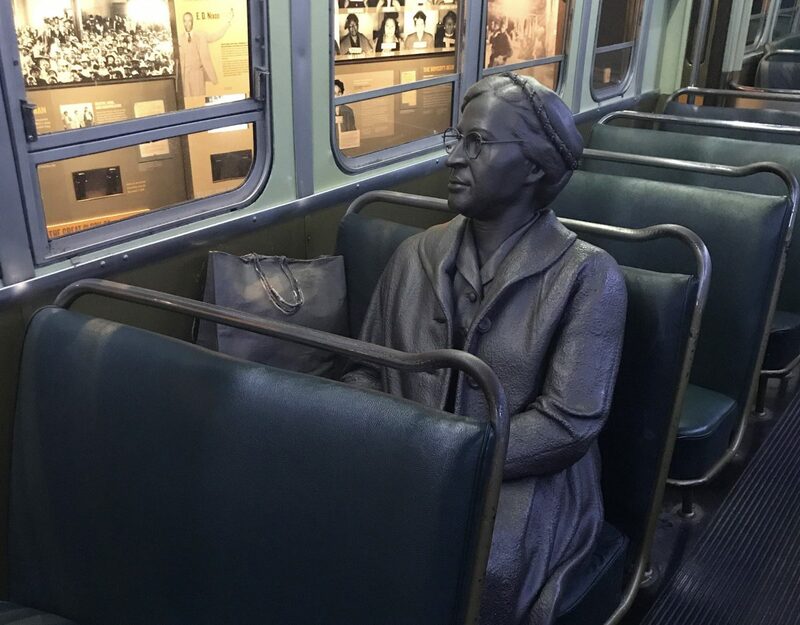 I teared up seeing the bus and Rosa Parks statue! I’ve added this place to my “must visit” list. Great pictures. I’ve only been to Tennessee once, but wasn’t able to make it to the museum. Definitely on my list for the next time. Thanks for sharing this important history! They really packed a lot into that museum. Can people actually go through the tunnel that that gate covers? 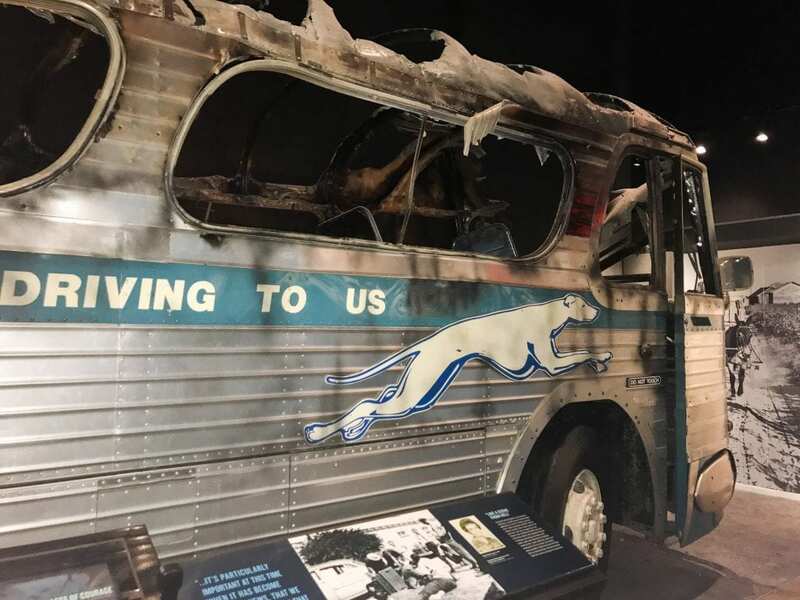 Thank you for sharing some pictures and a bit of the history that the museum shares. It must have been a sobering experience. I think the tunnel is open sometimes, or it was in the past. It wasn’t open the days we were there, though. These look like really good stops in Memphis. We recently visited but went to a planetarium, and a Fried Chicken place. We really loved the town. Love this post! Now I have a new bucket list item! I don’t really need to go myself! Your post help me figure that out! Can’t wait to go there! Thanks! Thank you for sharing this! I too try and keep my children educated on history and help then to realize why kindness is so important. Next time you travel to Memphis, you should visit Mud Island. It has a fascinating history of the whole Mississippi River and it’s importance in history. I love it there. Mud Island sounds cool! I’ll have to check it out. We usually drive through Memphis on our way to Florida, so I’ll keep it in mind for our next big road trip. 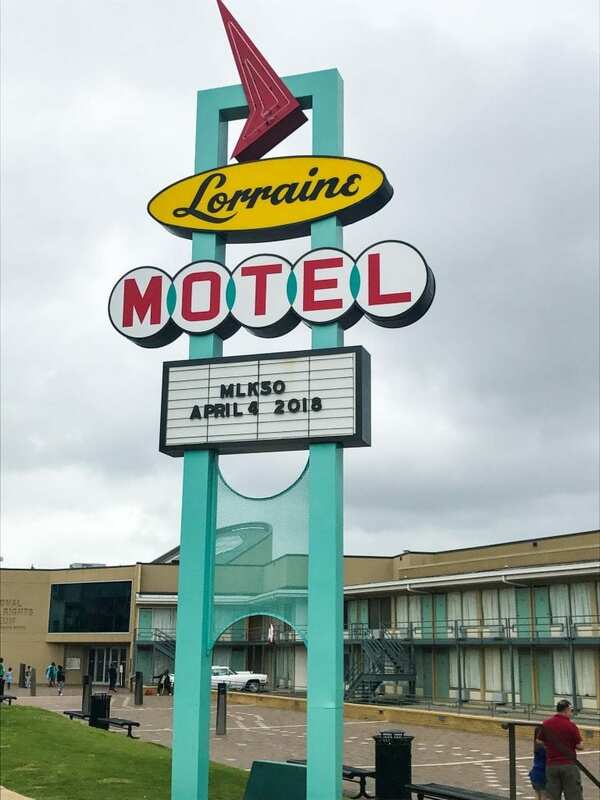 What a great short trip and I love how you used this moment to teach your daughter about love and tolerance and give her a view of our history, no matter how ‘ugly’ it is. Experiencing this really makes it more real than just reading about it in a history book. Thank you so much for this post. Someday I hope to make it that way and will have to make this a stop. Thanks for sharing. Wow, I didn’t know about this place. Looks like a great place to visit. 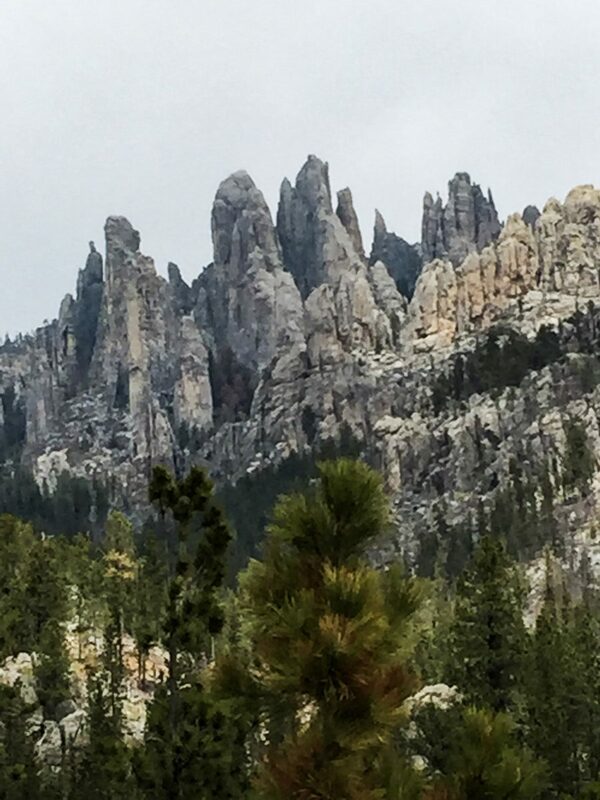 What a great place to get our kids–and ourselves–thinking and talking. 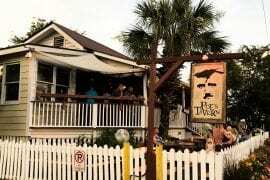 Great place to visit! Much history! Good article. Such history! This looks like a really great museum. I love the gate! We drove right through Memphis on our way to Branson back in November, but never stopped. I think we were too focused on our final destination. I do regret it, though ~ just to stop and say we were did. 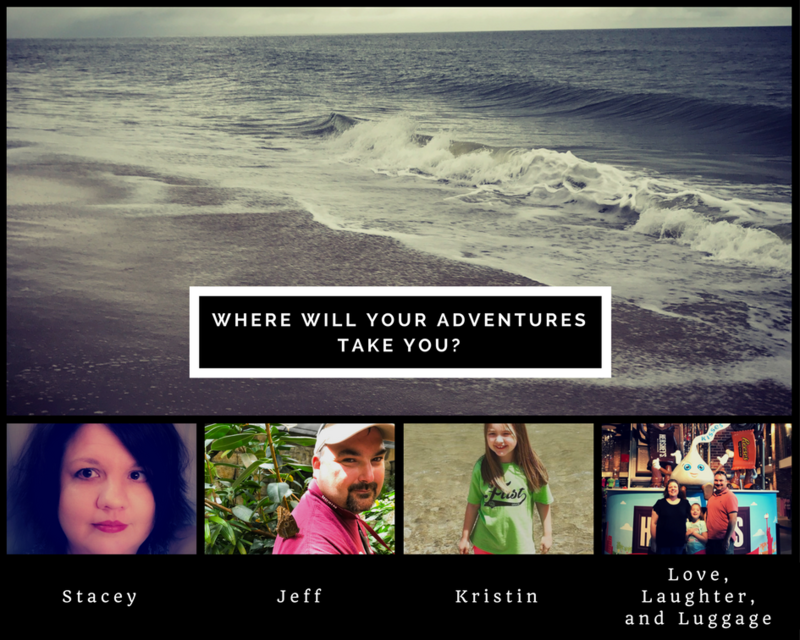 Thanks for sharing your story, though ~ gives me something to add to our itinerary the next time we travel through. You should do it! We really only spent 24 hours in Memphis, but we experienced a lot! I have been to this museum. Totally worth the trip!